Whiskey, wine and bitters merchant Fortune Chevalier was born in 1815 in Belle Isle, France. As a young man Chevalier apprenticed as a stained glass craftsman and together with a group of similar craftsmen, he worked all over France repairing the stained glass windows at various castles and churches. In 1850 Fortune sailed to San Francisco with the intent of establishing a window construction and repair business but by 1857 was running a small unrelated business in bustling Placerville. Chevalier later moved to Sacramento and went to work learning the wine and liquor business at the wholesale house of A.H. Powers & Co. Sometime after leaving Powers & Co. Chevalier started his own wholesale liquor concern at 42 K Street in Sacramento. Chevalier became the sole agent for Old Castle Bourbon Whiskey and in 1872 he moved the business to San Francisco. Three years later he took Augustus Comte into partnership. Comte had years of experience in the wine business and was possibly brought in as a partner to expand Chevalier's business into the wine market. Meanwhile the F. Chevalier & Company was producing some of the most desirable and coveted glass containers ever blown on the west coast. The spiral neck Chevaliers Old Castle Whiskey, F. Chevalier red whittled Whiskey merchants fifth and the Chevalier Castle flask are all considered extremely collectable and high dollar additions to a western bottle collectors shelf. Not as rare but just as collectable are the Chevalier bitters and cordial or tonic containers. The Celebrated Crown Bitters was produced from sometime in 1880 to around 1886. This bottle comes in both an applied top and tool top example. The applied top bottles are a little cruder and a lot more desirable than the tool top examples. 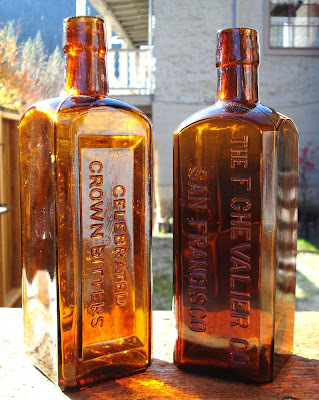 Chevalier also produced a "generic" product bottle after 1886 embossed The F. Chevalier Co. San Francisco. Western collectors generally believe that this container contained the Celebrated Crown Bitters also. In my opinion this bottle could have been used for the bitters, but also could have contained a cordial or tonic product. Nice Article Rick, I Found the one on the right, out front of an antique store on a table years ago here in San Diego, I had seen the one on the left before, but, not on the right. I am guessing the one on the Left is earlier? An incredibly beautiful western bottle with a colorful history behind its amazing embossed castle ! I had an amazing gloppy topped yellow Chevalier’s with fizzy bubbles I enjoyed for many years .